The commercial capital of Nigeria, Lagos, has been ranked second on the World’s Least Liveable Cities. This is in spite of the progress the city has made since 1999 when democracy returned to Nigeria. Lagos ranked 139th out of 140 cities that were featured in the liveability survey conducted annually by the Economist’s Intelligence Unit. 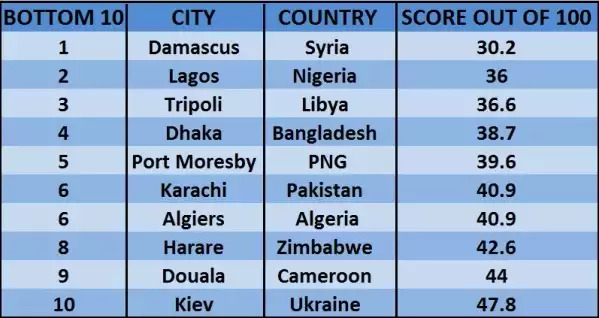 Syrian capital rank Damascus ranked 140th while Libya’s Tripoli and Bangladesh’s Dhaka came 138th and 137th. On the other spectrum, Melbourne has topped a list of the World’s Most Liveable city for the seventh year running but terrorism and diplomatic tensions are eroding living conditions worldwide, an annual report from the Economist has found. 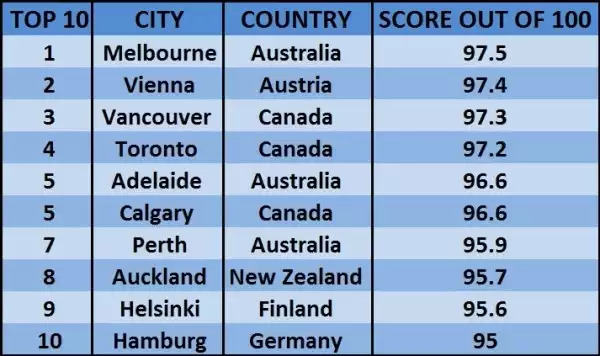 The Australian city was ranked number one out of 140 cities, slightly ahead of the Austrian capital Vienna, with the Canadian trio of Vancouver, Toronto and Calgary completing the top five. “This is a win for all Victorians, who contribute so much to making Melbourne the best place to live in the world,” said Victorian state Premier Daniel Andrews. AFP reports that the survey, released Wednesday, scores cities on five broad categories: stability; healthcare; culture and environment; education and infrastructure. The Economist’s Intelligence Unit found that medium-sized cities in wealthy countries fared best. “These can foster a range of recreational activities without leading to high crime levels or overburdened infrastructure,” the report said. “Violent acts of terrorism have been reported in many countries, including Australia, Bangladesh, Belgium, France, Pakistan, Sweden, Turkey, the UK and the US,” the report found. “This stems in part from unrest related to a number of deaths of black people at the hands of police officers,” the report found. It said increased diplomatic tensions — from Russia and the Ukraine to North Korea’s nuclear threat and Iran’s relationship with its neighbours — was leading to declining stability scores around the world. Conflict was the main factor for those cities finishing on the bottom of the survey, with Syria’s Damascus at number 140, behind Nigeria’s Lagos, under threat from Islamist groups like Boko Haram and Libyan capital Tripoli, caught up in middle eastern strife.